WAKEFIELD chairman Michael Carter (pictured) has confirmed that Mason Caton-Brown’s transfer fee has now been paid by the Toronto Wolfpack. The clubs agreed a deal for the 25-year-old winger around two weeks ago. But, according to Carter, the agreed fee was still outstanding until Wednesday. 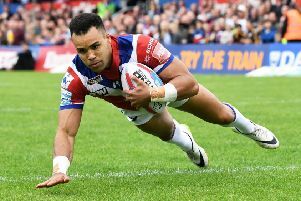 Trinity had reportedly applied to the RFL to have Caton-Brown’s registration to Toronto suspended due to the transfer fee not being paid. The winger did not feature in the Wolfpack’s 14-0 win over Halifax on Sunday afternoon. But Carter confirmed on Wednesday that the Canadian club had finally fronted up the agreed amount. “The transfer fee has now been paid, all is good in the world again,” said Carter on social media. Carter also put to rest any doubts regarding the details of Caton-Brown’s move after Wolfpack coach Paul Rowley said the 25-year-old was only a loan signing.